Shutter 1/80th second, ISO 3200, f/3.5, 10 mm on Nikon 10-24 lens. Camera: Nikon D5100 on tripod with remote release. Shot in RAW, processed in Lightroom. 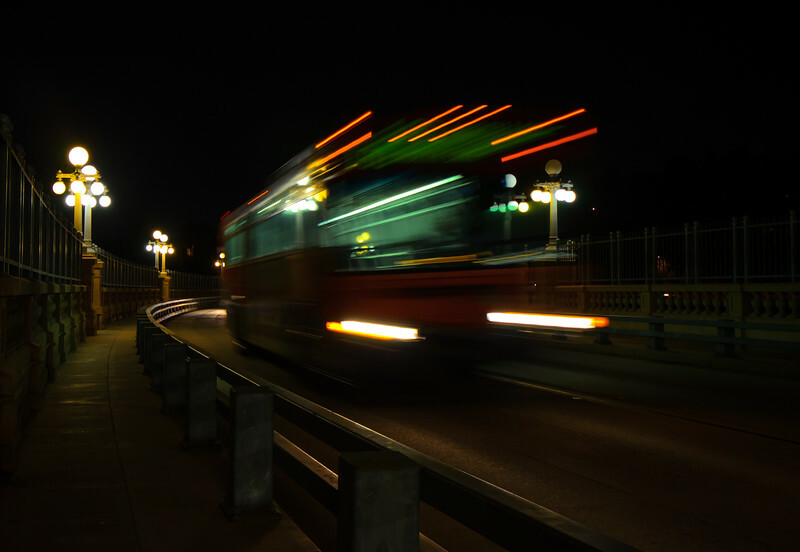 I went out last night to practice some night photography and went to the Colorado Avenue Bridge over the Arroyo Seco in Pasadena - aka the Suicide Bridge. There was a sliver of moon setting in the West and I was hoping to get a photo or two of buses (I work for a transit agency) with the moon in the background. That didn't really work out -- the moon set before I could get properly set up and my wide-angle lens made the moon too small. But I got these shots, which I kind of like. 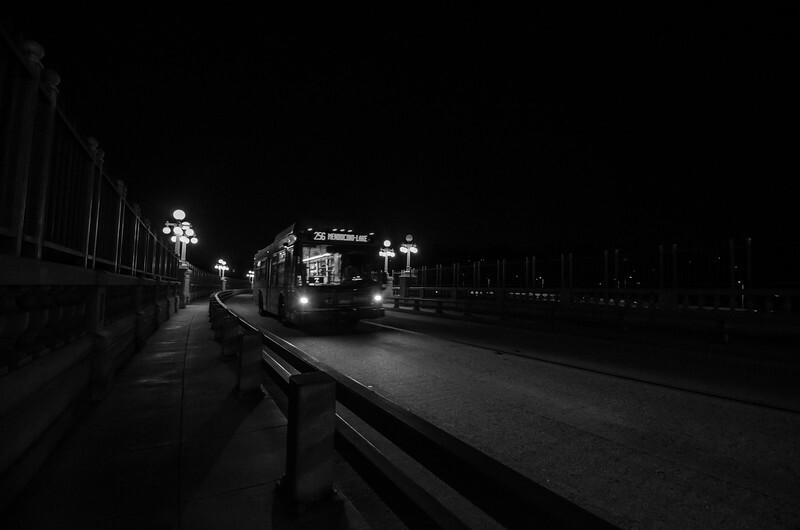 I converted the top one to black and white because I liked the mood and I purposefully kept it dark and didn't crop; sometimes having empty spaces in a frame is interesting and I was trying to convey the lonesomeness that goes with riding a bus at night. The bottom photo isn't quite as interesting -- I was just trying to capture the motion without blowing out the light coming from the old-timey streetlamps. I kind of like the colors. Shutter: 1/6 second, ISO 400, f/5.6, 24 mm on 10-24 Nikon lens. Camera: Nikon D5100 on tripod with remote release. Shot in RAW, processed in Lightroom. Please visit my portfolio on SmugMug and follow me on Twitter.